Optical coherence tomography (OCT) is a tool to visualize a cross section of the ocular tissue as difference of the reflectivity by measuring interference of the backscattered light. OCT provides images of the tissue at a very high resolution close to a histologic examination. Like ultrasound images, a cross-sectional OCT image is called B-scan and composed of multiple A-scans. As the ocular media is transparent, incident light enters the eye and is backscattered from the tissue. The reflectivity is shown as spectrum of gray scale or pseudo-color coding. 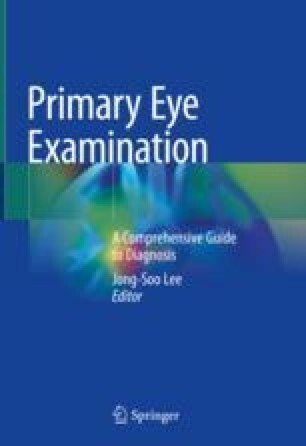 OCT is now an essential tool for diagnosis and follow-up of many retinal diseases, corneal diseases, and glaucoma. The recent developments enabled angiography based on OCT technology. This chapter will describe the basic principles and interpretation of OCT images as well as OCT angiography.